Super-Blog Team-Up returns with a Doctor Strange-driven look at magic in comics! Now, Halloween was last week, so I’m a couple days late for Dracula, but with his movie out this week, I’m right on time for Doctor Strange … and it’s always time for Bronze Age Marvel here at Longbox Graveyard. So let’s jump right in as Doctor Strange battles Dracula, Lord of Vampires! This two-part crossover began in Tomb of Dracula #44, smack-dab in the middle of the classic run by Marv Wolfman, Gene Colan, and Tom Palmer. I’ve sung the praises of Tomb of Dracula here at Longbox Graveyard before (twice!) — it really might have been the finest Marvel comic of its age. And one of the reasons the book worked so well was that writer and editor Marv Wolfman largely kept Dracula and his tales sequestered from the rest of the Marvel Universe. 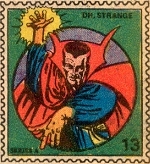 While Drac would encounter Spider-Man and Thor in other titles, Marv jealously guarded the door of Dracula’s own book, ceding to editorial pressure to more closely connect Tomb of Dracula with the Marvel Universe only through crossovers with otherworldly and supernatural characters like Silver Surfer, Brother Voodoo, and (in our case) Doctor Strange! The first part of the tale, written by Marv Wolfman, opened with Strange mourning the death of his faithful manservant, Wong, beneath the flashing fangs of a vampire! Just look at Gene Colan’s smokey pencils, beautifully illuminated by Tom Palmer’s perfect inks! There’s never been a better team for supernatural comics storytelling! But this wasn’t just any vampire — this was Dracula, the Lord of Vampires, as Strange discovered when his sorcery allowed him to experience Wong’s final moments. Harnessing the fathomless powers of the All-Seeing Eye of Agamotto (which then, as now, could do about anything the writer needed it to do), Doctor Strange tracked the “life-patterns” of Dracula from the scene of the crime to Dracula’s lair in Boston. I love how Colan’s “camera” pushes in on Dracula, starting with his open coffin, then Dracula in repose, and then Dracula alert to Strange’s intrusion. Looking at this sequence, did you “see” Dracula’s eyes snap open between the last two panels? That’s the magic of comics, boys and girls — like Scott McCloud noted, comics are as much about what you don’t see between the panels as what you see in the panels themselves. After that? Well, it’s on! But this battle between Dracula and Strange wasn’t the usual Marvel Comics Fist City beat-down, and it wasn’t even a garden-variety Doctor Strange ectoplasmic duel of ghosts. No, to battle Dracula, Strange invoked the “Images of Ikonn” to delve into Dracula’s “passions and fears,” taking Dracula back to the moment his mortal self fell on the battlefield in a cavalry duel with Turkish invaders. It’s kind of dirty pool, to be honest. (Don’t take a job with Dracula, folks). Taken aback by Dracula’s sudden recovery — and reluctant to use his “more potent magics” for fear of rendering Dracula incapable of restoring Wong to life — Doctor Strange was quickly mesmerized by Dracula. 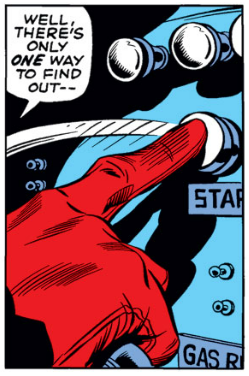 How’s that for a vintage Marvel shock ending? Doctor Strange is dead? Say it isn’t so! Fortunately, we needn’t wait even one week to see how this one turns out … the tale continued in Doctor Strange #14! While this issue was written by Steve Englehart (who firmly put his stamp on the story, as we shall see), the book was illustrated by the self-same team of Colan and Palmer, and also edited by Marv Wolfman, resulting in an unusually coherent crossover, at least by Marvel standards. The issue opened with Dracula gloating over his fallen foe, casting Strange’s body into a dungeon, where he might rot until rising, three days later, as Dracula’s undead slave. But in his arrogance, Dracula didn’t reckon that Doctor Strange might be “no stranger to death,” as we learn that Strange escaped death by leaving his body instants before Dracula killed him at the end of last issue. But now, Strange was trapped outside his body, in astral form, with only three days to concoct a solution to his dilemma. So what did Strange do? Why, he thought, of course! But all the thinking in the world didn’t solve Doc’s trouble. After trying to distract Dracula with visions and spells — and nearly catching Dracula out in the daylight — Strange was still a helpless, disembodied spectator when Dracula returned three days later. But Dracula was taking no chances, and in an odd reversal of roles, he sought to put a final end to the undead Doctor Strange with a stake through the heart! Right on cue, Strange rose as a vampire, and we finally got some fist-and-fang action, as Dracula battled with a thing that was not-quite-Strange: Doctor Strange’s body, given in to dark vampiric impulses, while Strange’s conscience was helpless to intervene. And it didn’t take long for Dracula to gain the upper hand against a Doctor Strange reduced to bestial impulses. It’s when Dracula had Doctor Strange on the ropes that something intriguing and even a little profound occurred. When Dracula asserted himself as “Lord” while strangling the life from Strange, from the depths of his possessed soul, Doctor Strange called on the power of the Christian god to save his life! It’s a bold turn of events, and something Steve Englehart didn’t shy away from — he once featured God Himself in a Doctor Strange story, then authored a bogus fan letter to deflect scrutiny — but what’s most interesting to me about this moment is what it asks about Doctor Strange’s own spirituality. Does Doctor Strange believe in the Christian god, or is He just another deity in the Rolodex, to be invoked like Cyttorak or Vishanti? In his moment of greatest extremis, it is the Christian god that Strange turns to for salvation. Is Strange a man of faith, or is he just happy to use the best tool at hand? Strange’s body and soul become one again even as Dracula is sent down to defeat, but Englehart implies that the will and even the cruelty required to overcome Dracula’s evil doesn’t come entirely from the divine force Strange invoked — that the “… true Dr. Strange would find no pleasure in his (Dracula’s) pain … that his tormentor (Strange) has been touched with Dracula’s own evil …” This conclusion points to an (ahem) strange duality, with the power of God getting Strange back on his feet, but Dracula’s own dark power of evil being the special sauce that let Strange finish the deed and kill Dracula for all time. And with Strange’s (and Wong’s) souls miraculously restored through Dracula’s death (could Drac have died for their sins? Nah …), that brings this tale to a close, and with it this installment of Longbox Graveyard! It’s been awhile since I posted here, and it feels good! I hope to make this a more regular occurrence — please let me know what you think of this story and Steve Englehart’s Strange cosmology in the comments section below! But, before you go — it took the awesome power of Super-Blog Team-Up to wake Longbox Graveyard from its Odinsleep … assuming you view this as a welcome development, please pay your thanks forward by visiting these other Super-Blog Team-Up articles, all looking at some form of “Strange” Magic! Grabbed me right with the first page, which frames the Doctor Strange against delightful panels from the character’s past by artists like Steve Ditko and Gene Colan. But then turn the page, and we are in a new era, with artist Chris Bachalo showing Doctor Strange casting spells and stealing kisses in a world unique for the way Strange sees it — overrun by microscopic monsters and unseen demons. Very nice use of color (and the absence of color!) by Bachalo, as well, although his line work isn’t as clean as in his recent X-Men work (which might have something to do with three inkers being credited on this book). Author Jason Aaron jumps right in and makes Doctor Strange his own, knitting him together with other Marvel sorcerers in a secret club, and hinting that a reckoning is coming for Strange’s reckless ways. The monster at the end of the story is genuinely creepy … and I would have left it there, because the little five-page backup story explains maybe too much, stepping on the mood of the main feature. Strange would have benefitted from a bit of internal conflict, but this is a quibble. Among the strongest books of Marvel’s new line. Great! I can’t imagine a better reintroduction for this old favorite. Visit my Doctor Strange Gallery on Pinterest. Read my columns about Doctor Strange: Superhero Greenlight: Doctor Strange, Steve Ditko’s Strange Faces, and Beneath The Longbox Shortbox. Ian McShane — Marvel Movie Supervillain! I love Ian McShane and we need to get him a gig as a Marvel movie supervillain, RIGHT NOW! McShane is brilliant — glowering, menacing, magnetic, soulful. He would make a spectacular Marvel movie villain. Unfortunately, the Marvel Studios docket is pretty full, and I don’t see a role for McShane in Avengers 2 or Ant Man. And I don’t want to see him under heavy makeup as a cosmic heavy in Guardians of the Galaxy — we need to see McShane’s eyes and expression and hear that voice in the most direct means possible for maximum villainous effect. Fortunately, Marvel Studios isn’t the only game in town when it comes to Marvel movies! Sony recently announced plans to blow out their Spider-Man license to a full slate of films featuring characters like Venom and the Sinister Six. Yes, this is storytelling bloat, and yes, this is an unwise line extension and a naked cash grab on behalf of Sony. But if we must be made to suffer through a Sinister Six movie, then how about Ian McShane as … Kraven the Hunter? Being a gentleman of distinguished years, we will have to reimagine Kraven a bit to suit McShane. As much as I love Steve Ditko’s original design, I don’t see McShane leaping around on rooftops while rocking an outrageous lion skin stole! But I could see McShane as what Kraven became over time — a dangerous, bitter, tough old bird who had hunted and killed everything worth killing … save for Spider-Man. Effectively, we’d jump right to the end of Kraven’s arc with his first appearance, embracing the dying hunter we saw in Kraven’s Last Hunt. A half-mad Kraven drinking poisonous spider venom to “wear the skin” of his most hated quarry? That’s a Kraven McShane could play! Sony isn’t the only studio looking to catch a bit of Avengers magic with their Marvel licenses. Fox is milking the heck out of X-Men, but they’re also looking to get the Fantastic Four franchise relaunched. The movie has a release date and a director attached, but casting information hasn’t passed the rumor stage. So, how about McShane as … Mole Man? Age-wise, this is a better fit for our man, and McShane showed in American Horror Story (Season 2) that he can play an unhinged, hair-in-his-eyes sociopath that has been shut away from the world. Plus, McShane has the inner nobility to pull off the misunderstood monster and fallen king that is the Mole Man. About the only change I’d make to Mole Man is removing his crazy shades so we can always see McShane’s gun barrel eyes. Finally, it is a rumor of a rumor at this point, but it sure looks like Marvel will be sending us a Doctor Strange movie sooner or later, so how about Ian McShane as … Baron Mordo? This might be the best role of all for McShane … I can totally see him as the most evil sorcerer in the world. But Doctor Strange is too far away! I want McShane in a Marvel movie right now. Or better yet, give me McShane in all three roles! Why not? If Chris Evans can be both Captain America and the Human Torch, or if we can get two different Quicksilvers in two different superhero blockbusters, then is it such a stretch that McShane might play three Marvel villains for three different studios? Let’s make this happen! Forward! Give me YOUR Ian McShane villain casting ideas in my comments section, below! 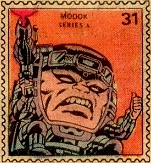 Visit my Steve Ditko’s Strange Faces Gallery on Pinterest. Read my column about Steve Ditko’s Doctor Strange — Beneath The Longbox Shortbox!